This post is a continuation of a series of posts I’m putting together around using design patterns in Sitecore, and will show a “proof of concept” around using the Singleton pattern — a creational pattern which restricts the creation of a class to only one instance, and also provides a global reference to it. 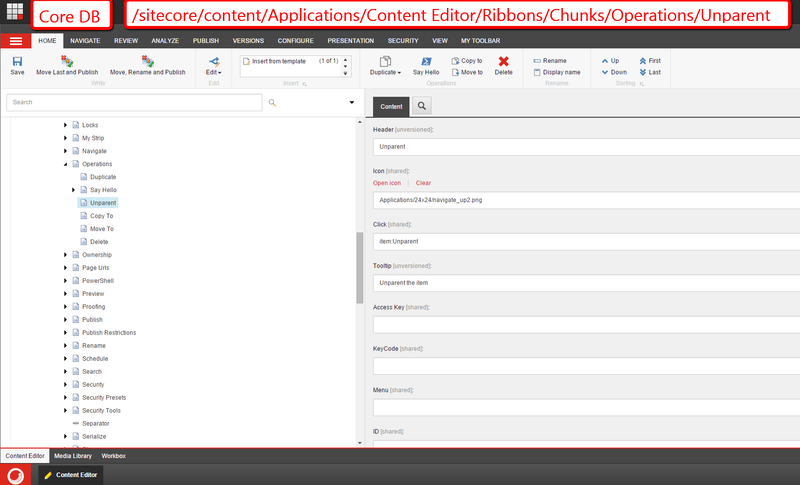 In this “proof of concept”, I am using a Singleton which contains a method that will “un-parent” an Item — all of the Item’s children will become its siblings in the Sitecore content tree — and will utilize this in a command which will be wired-up to the Sitecore Ribbon. 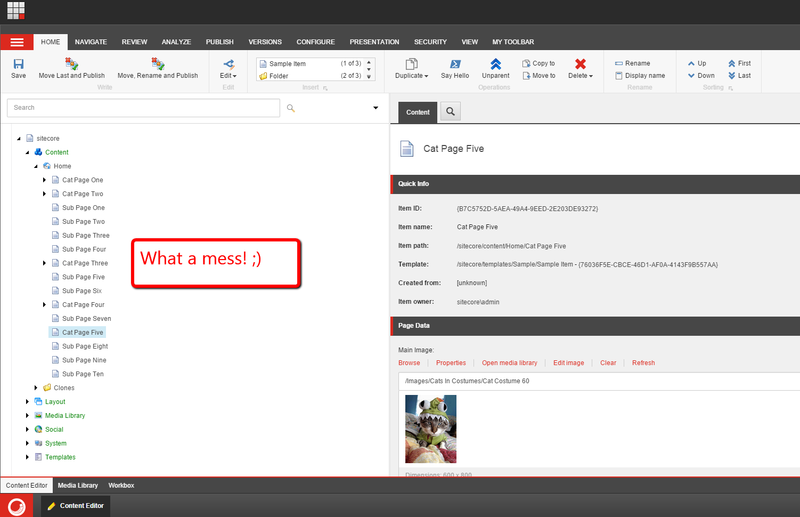 I honestly don’t see much utility in having such functionality in Sitecore — you just might 🙂 — but the functionality itself is not the purpose of this post. Before going into the details of why the class above is a Singleton, I want to point out that it contains one method — the Unparent() method — which iterates over all child Items of the Item passed to it, and moves them under the passed Item’s parent — this will move these child Items to the same level as their former parent. You might be asking “what makes this a Singleton”? The first clue is the private constructor — this class cannot be instantiated by other classes. It can only be instantiated from within itself. This instantiation is being done in the logic of its Current property. If the static private variable “current” is null, we “lock” an arbitrary object — this is done to make this multithreading “friendly” so that we can avoid collisions in the case when two different threads invoke the Current property at about the exact same time — and then create an instance of the ItemOperations class. This instance is then saved in the static variable “current”. When the next call to the Current property is made on this class’ type, the “current” variable is already set, so the instance stored in it is returned to the caller. The reason why the variable “current” and its associated property “Current” are static is to ensure these aren’t bound to an instance of the class but instead are bound to the class’ type, and the “Current” property can be accessed directly on the class’ name. The QueryState() method checks to see whether the selected Item in the Sitecore content tree has any children and returns the Hidden value on the Sitecore.Shell.Framework.Commands.CommandState enum — this lets the Sitecore Client code know that the button associated with this command should be hidden. If the Item does have children, the Enabled value on the Sitecore.Shell.Framework.Commands.CommandState enum is returned. 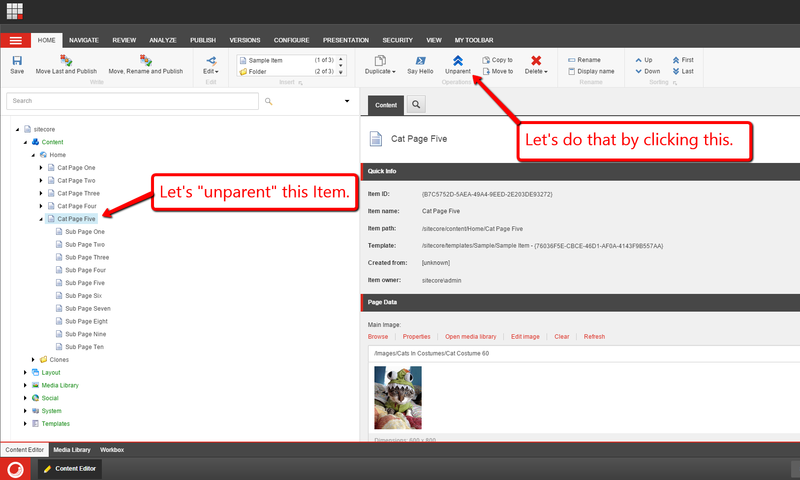 The Execute() method just passes the selected Item in the Sitecore content tree to the Unparent() method on the ItemOperations Singleton above — the Unparent() method is where the child Items are moved up a level. I won’t go into details of the above as I’ve already covered how to do so in many of my previous posts — do have a look! As you can see, this Item was “un-parented”. Ok, now that we had some fun with this, let’s have a serious discussion about the Singleton pattern — yeah, I know serious discussions aren’t always pleasant but what I have to say is pretty important regarding this pattern. Although the Singleton pattern does make it easy to implement things quite fast, and does allow for less memory usage due to having less object instances floating around in memory, it unfortunately promotes tight coupling in your classes. If you have to change something on the Singleton class itself — perhaps a method signature on it — you will have to also update every single class that references it. This can be quite costly from a development effort and painful — especially if the Singleton is being referenced in a gazillion places ( is gazillion a word? 😉 ). So, please do think twice before using this pattern — sure, it might be alright to use a Singleton in a pinch but do be sure it won’t lead to a maintenance nightmare for future development in your Sitecore solutions.